Brave, original, inaugural. Those are words synonymous with “pioneer.” Of course, that word also evokes images of Early America, with its barrage of hardships and history-making heroes. While our nation’s earliest inhabitants braved rugged terrain and untamed wilderness, the Pioneer Collection from Rehmeyer Premium Hardwood Flooring offers quite the civilized terrain for your feet to travel. Yet, in many ways, this collection is a throw-back to simpler times and definitely demonstrates a brave creativity that hints at history. Each board chosen to be used in our Pioneer Collection flooring possesses an exceptional degree of character, highlighting the particular beauty of the species it represents. 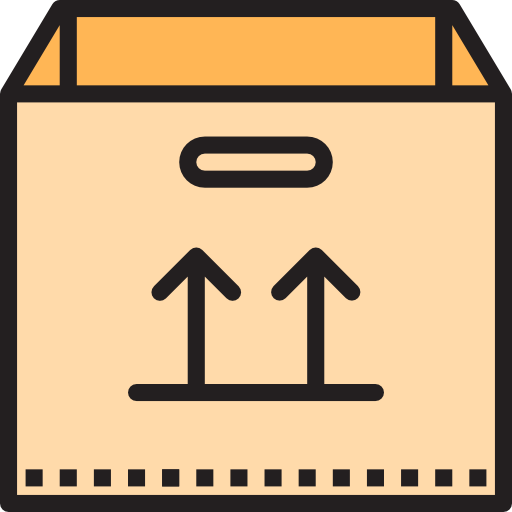 Each floor, regardless of species, is made from random-width boards ranging from 3 to 6 inches and lengths ranging from 18 to 120 inches. Customers have the choice of pre-sanding with either soft or micro-bevel edges, flush pegs, Tung Oil finish, Engineered hardwood, and matching accessories. If we had to choose a single species in this collection that epitomizes the spirit of the Pioneer Collection, it would have to be the Pioneer Collection Wormy Maple. This character-grade species offers the ideal raw material for a floor whose name hints at perseverance and rugged individualism. The unusual striping of this character-grade wood is the result of the ambrosia beetle’s distinctive wormholes. Instead of adding stain or utilizing any of our distressing techniques, we let this species speak for itself. 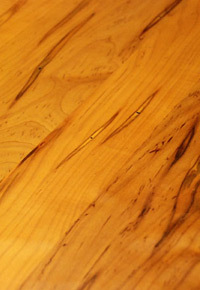 The amazing natural beauty of Wormy Maple can be enhanced by our simple Tung Oil finish. In addition to Wormy Maple, Pioneer Collection species include Walnut, White Oak, Cherry, Red Birch, Hickory, Red Oak, and Pine. We’ll look now just at the first four. Our Pioneer Collection Walnut flooring showcases sound knots, striking grain, and deep brown coloring that can appear to deepen with our Tung Oil finish. 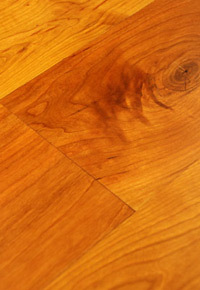 We use Unsteamed Walnut that is sawn especially for use in our Pioneer Collection flooring. Pioneer Collection White Oak provides an especially rustic appeal that’s ideal for accentuating contemporary or eclectic décor. This hard, stable species is particularly resilient and boasts exceptional visual appeal via gorgeous sound knots. We love adding Soft Edges and our Tung Oil finish to complete the classic appeal of White Oak. Pioneer Collection Cherry holds appeal to those who want a cross between formal elegance and rustic charm. Smooth grain is juxtaposed to the sound knots, providing a striking contrast. Pre-Sanding and Soft Edge options showcase the individual beauty of each individual board, and our Tung Oil finish adds to the warmth of this rich species. Pioneer Collection Red Birch definitely follows in the pioneering spirit! 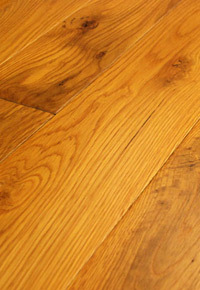 With sound knots, silky grain, and coloring similar to Cherry, this hard wood is perfect for high-traffic areas in both residential and commercial environments. We recommend Pre-Sanding, Soft Edges, and Tung Oil options. Located in Shrewsbury, Pennsylvania, Rehmeyer Wood Floors offers a full range of custom milled and engineered hardwood flooring. Rehmeyer’s flooring is all 3/4″ solid hardwood and sold unfinished, prefinished, or completely custom finished to suit your project. Call Rehmeyer Wood Floors today toll free at (888) 474-4047 or browse through our website at RehmeyerFloors.com to learn more about our custom flooring services. Rehmeyer Wood Floors ships nationwide throughout the United States.